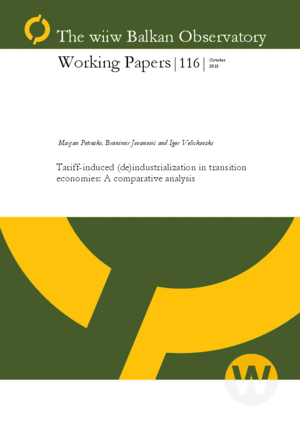 In this paper we investigate if tariffs affect manufacturing value added in 25 countries from Central and Southeast Europe, the Commonwealth of Independent States and Middle East and North Africa over the period1990-2010. We use an instrumental variable approach, with the World Trade Organization bound tariff and the lagged tariff as instruments. Results suggest that, in general, lower tariffs seem to lead to higher value added, through the higher imports of inputs in the production process which were either inexistent or more expensive on the domestic market previously. The effect is not driven by the World Trade Organization membership, but by individual countries’ decision to lower their tariffs. However, there are notable differences in the effects between different groups of countries and industries: tariffs are not found to affect industrialization in Southeast Europe and Middle East and North Africa, which implies that their decision to liberalize trade was likely premature. This is supported by the finding that lower tariffs have positive effects on industry value added only in industries with higher value added (i.e. more mature industries).